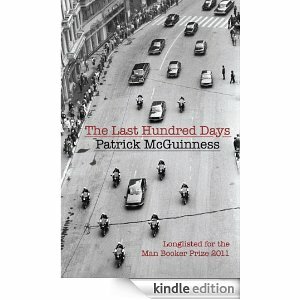 I have just spent the last couple of hours attempting to download The First Thousand Days by Patrick McGuinness on my Kindle. For some reason, and I suspect that reason is the game addict (AKA Hodmandod Minor) in the room down the landing, my kindle was having trouble maintaining a connection to the Amazon server. So I phoned Amazon.co.uk, and a patient man called 'Carlos F' went through various possibilities with me, eventually suggesting that I either disconnect my router (which would not go down well with Hodmandod Minor) or switch off the connection to my router on my Kindle. He advised me to try the latter ...and lo, The First Thousand Days has landed successfully in my lap. All day I have been reading a book written in the sparse style of J.M. Coetzee. It is a good book, but after a while it made me long for something richer. Now that I have the McGuinness, I feel as though I have swapped the worthy but prickly sackcloth for sumptuous velvet (even though this is Communist Romania). 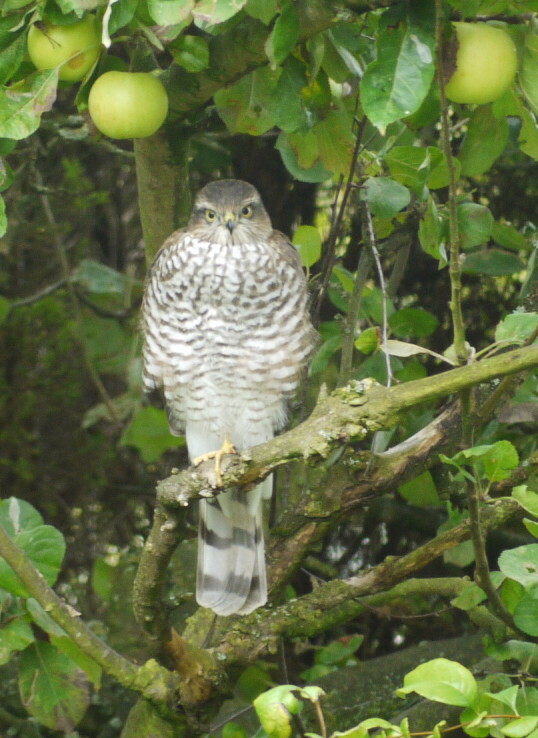 We had a surprise visitor in our garden today: some sort of bird of prey, maybe a falcon*. 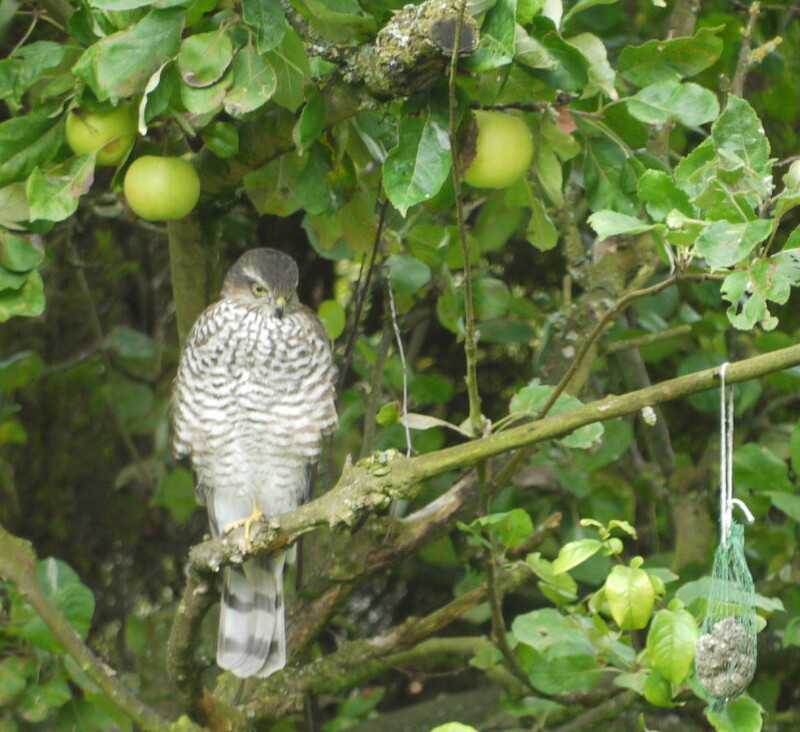 It sat perched on one leg in our apple tree, coolly looking around with its mean yellow eyes, allowing Hodmandods Senior and Majorette (and me) plenty of time to take a photo. Hodmandod Majorette's were by far the best and I have posted two of them here. and this RSPB website, I have come to the conclusion it was, in fact, a young sparrowhawk. A hurricane is approaching New York; there are reports of a surge of water flooding between sky scrapers. The flood defences have been breeched. The water is rising. There are warnings to stay indoors, to retreat into a room with no glass, avoiding vestibules. It is frightening, even from the other side of the Atlantic, I can empathize - especially as I contemplate my latest reading plan: the dystopian novel. Dystopia means, I have just discovered, 'a state in which the condition of life is extremely bad as from deprivation or oppression or terror' and for some weird reason, I like to read about such things. I suppose there is a thrill involved of being scared by proxy, not believing in the deep dark heart of me that such things could ever take place. 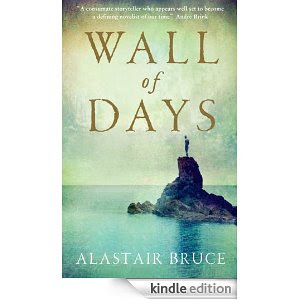 So in 'Wall of Days' by Alastair Bruce the world is flooded, and in the 'Testament of Jessie Lamb' the human race is likely to die out through an act of terrorism; while in 'Six Degrees' by Mark Lynas there is a description of happens when the earth warms degree by degree. 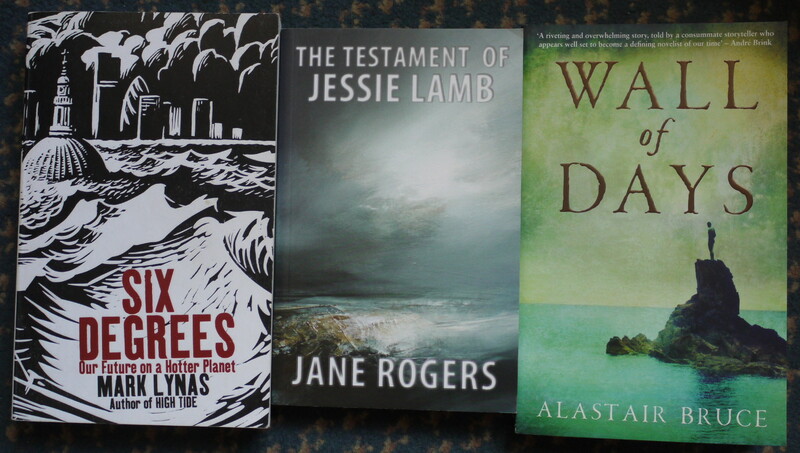 This latter one starts with the description of a hurricane, and in contrast ot the others is a work of non-fiction. From dystopian fiction to dystopian fact, then - and in consequence this last is the most terrifying reading of all. 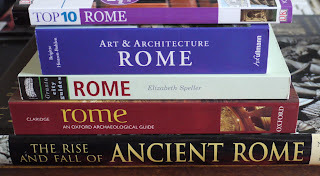 Today Hodmandod Senior and I decided to stock up on books for a trip to a 'mystery destination' this Autumn. Just for a change we decided to go to a bookshop. Once inside I couldn't seem to find the will to walk our again, until hunger drove me to an adjacent coffee shop. 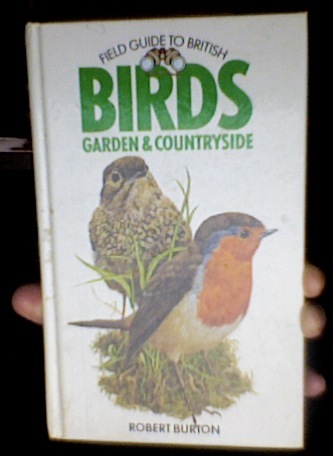 I'd forgotten how wonderful it was to have a good browse with the physical objects (i.e.books) to hand. 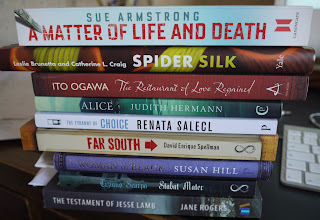 I was sorely tempted to buy a few more, but luckily remembered the towering TBR pile and managed to restrain myself. It was a near call though. The top 10 guide is for the actual trip. The Granta City Guide contains some guided walks. The Art and Architecture guide provides some good background information and pictures on the sights. The Oxford Archeological Guide contains a lot more background information. The big rise and fall book is a pictorial history and gives a good overview. How on earth I am going to get through all these before we go (and learn Italian, and do all the other things I need to do) I don't know, but I am going to have a go. 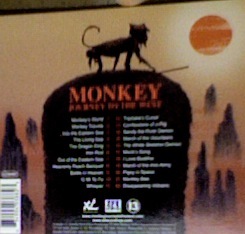 Obsessed as I am with the book 'Monkey: Journey to the West', I decided to buy this album with the same name. It is based on an opera of the same name written and directed by Chen Shi-Zheng, and composed by Damon Albarn, with visuals by Jamie Hewlett. 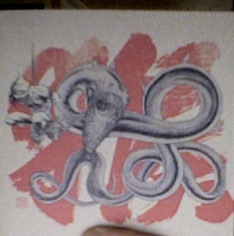 I am glad I decided to get the CD rather than download because the packaging is a small work of art in itself. with some of the words. We are going to Rome for a few days in the Autumn. 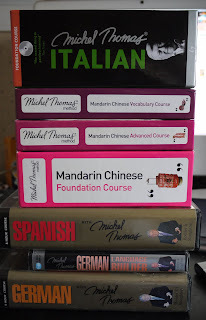 This gives me a good excuse to try and learn Italian, and for me this means another Michel Thomas course. This will be my fourth. Each time I start from a position of complete ignorance, so anything I learn makes a huge difference. I took my first Michel Thomas courses in German nine years ago: I started with the 'Foundation' (which takes about eight hours) and then went on to the 'Builder' (about four hours). This was in readiness for my trips to Germany to research for my Wegener and Hoffmann books. Although most of the people I spoke to in Germany turned out to be fluent in English, when I went to what was formerly East Germany there were a few non-English speakers. 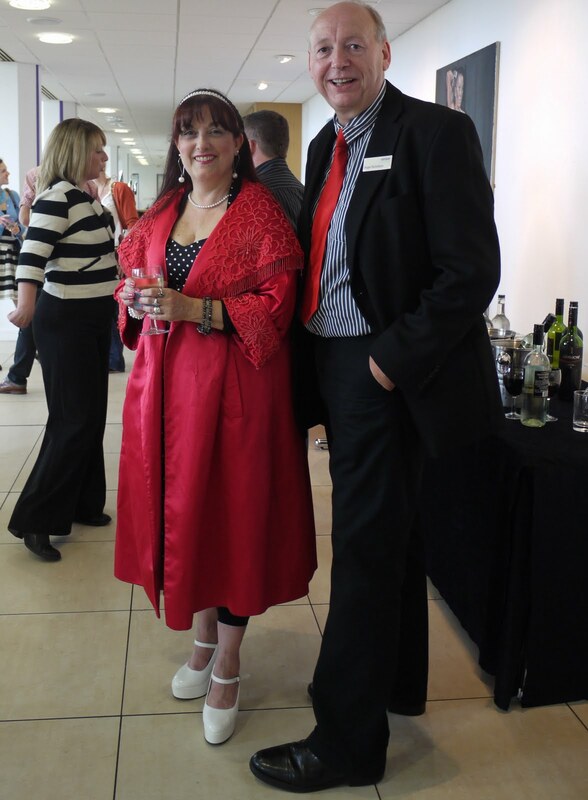 It was then that the course came into its own, and it gave me a little confidence as I tried to communicate there. My next Michel Thomas course, in 2004, was in Spanish. The Michel Thomas method concentrates on the South American version of Spanish which was great as far as I was concerned since I was planning on heading for Patagonia. This time I found myself cramming the course into a couple of days. Even so I found that enough of it stuck, and I managed to make myself understood (with hand signals and drawings) in a place where few people spoke English. So today the Foundation Italian course came.The courses have been revised recently, and now include a couple of review lessons at the end. This is an excellent idea, and something I felt was missing from the original. So, looking back over the last decade, I am a little surprised to see that I have attempted to learn five foreign languages (this includes Welsh which I learnt in Lampeter). It is a little bizarre since I have no aptitude for languages at all. I suppose the fact that I have enjoyed my attempts, and feel keen to try yet another is all due to the genius of Michel Thomas. I've been looking at literature from the Tang era today. 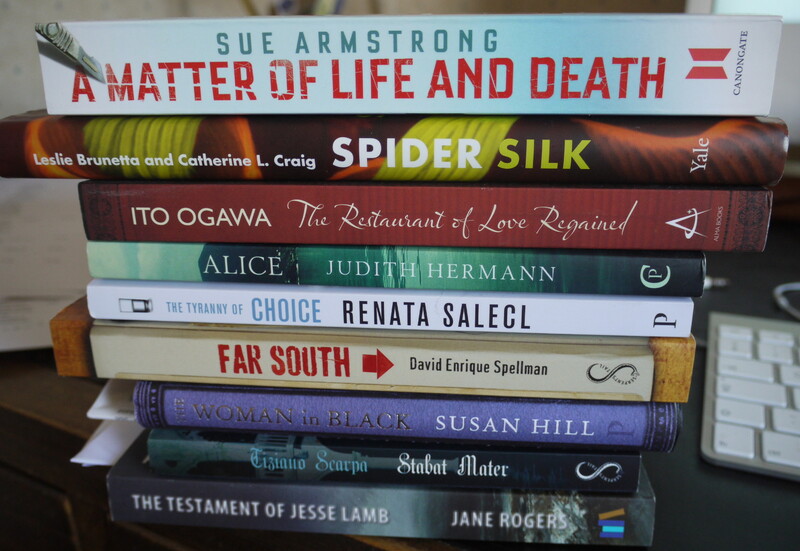 The selection is composed of poetry, essays and short stories. All the forms are unexpectedly readable. The ideas in the poetry are surprising in that they deal with concerns I would have thought would only belong to the modern era. For instance in this first one on drinking there are observations on aging and vanity. towards the sea, never turns back? At dawn black silk, by evening changed to snow? And never let your gold cup face the moon empty! This second one is a moving war poem, and was written in a time when there were some particularly vicious wars with heavy casualties. From a Song of War Chariots. The short stories are must be some of the earliest short stories (of the realistic non-mythic type) in the world. I had read that the Chinese did not have a word for romantic love. It is strange then, that each of the following three stories involve beautiful young women to which the hero becomes instantly attached. They have unexpected endings. The Story of Ts'ui Ying-ying by Yüan Chen (799-846). Chang is a man who admires beauty and yet cannot find a beautiful woman. One day on his travels, he manages to protect a widow and her young son and daughter. The daughter, Ying-Ying, turns out to be beautiful. However, she cannot show her true feelings. Chang tries to woo her but she appears uninterested. Her maid tells him to try poetry. Ying-Ying seems to respond to this, but when he goes to meet her, she repels him. He does not give up, and eventually she dreamily goes to his bed. These night-time liaisons continue for some time. He then has to go back to the capital to take civil service exams. He fails. he has to stay behind. He writes. She replies passionately, saying how much she misses him. He decides to drop her because he thinks beautiful women lead men astray and make them subject to ridicule. They both marry other people. He goes to see her many years later but she refuses to see him because she has become too thin and haggard as a result of his abandonment of her. The rituals and style remind me very much of 10th century Japanese books I've read. This is not surprising because Heian court life was based on the Tang Chinese court life. It is told in a straightforward way, and the poetic messages and far less obtuse and easier to understand. The Story of Miss Li by Po Hsing-chien. This story starts and ends in the first person giving the reason why the narrator thought it worthwhile recording. A father was very proud of his son and sent him to the capital to study. Here he came across Miss Li who lived with her mother who was low and unprincipled - in other words a prostitute. They fell in love. He inculcated himself into the house, declared his love and stayed until all the money his father had given him had run out. The mother and daughter then tricked him into leaving. They did this by moving from their house and locking him out, since their house was only rented. He was so upset he almost died and was taken in by first his former landlord , and then the undertaker. He became a professional mourner of some repute, and in competition with another undertaker won with his sad songs which caused everyone to cry. His father happened to be in town, and he was spotted by his father's servant. He confessed who he was, and his father took all his clothes from him and beat him until he was close to death. Friends rescued him, but his wounds were too troublesome so after a while they left him in the middle of the road. Here he was fed by passersby. He then recovered enough to become a beggar. In winter he passed by his Miss Li's house who took him in, defied her mother, paif her off and lived with him. She paid for him to buy books and study. When he entered his exams he passed first time, and then again with huge honours. This caught the attention of the emepror who promoted him. He then was assigned to his fathers area who welcomed him back. Miss Li was not going to come with him, but he persuaded her to do so, she was about to go home again when the father insisted she did not and the boy and Miss Li married. They had four sons - all of whom had high rank. The narrator thinks it strange that a prostitute should behave so well, which is why he recorded it. Apart from the story, there are interesting points of etiquette: the idea of an undertakers' competition enticing crowds of several hundred; the 'six rites of welcome' involved with betrothal, the fact it seems all right for the couple to live together before marriage, the fake modesty which seems to be part of etiquette, just as it was in Japan. This tale is quite different from the other two. A councillor is left in charge of the captial and become decadent and lavish. He is attended by rows of maidens. He also becomes idle and does not get up for visitors. Li Ching has a spirirted conversation with hi, and chides him. He is followed out of court by a young girl, aged about 18, who says the chancellor is 'corpse in which little breath remains'. She begs to be taken on by him. She is beautiful. They set up house together but find themselves being pied upon. They go on a journey and a curly bearded stranger befriends them. He has the same name as the girl so she defines her self as his little sister. Curly bearded has a human head, liver and heart in his bag; the latter two items they share with some wine. They find the new leader and get a Tao to interview him. The Tao confirms the new leader but also tells Curly Beard his conquests lie elsewhere. The new leader is installed by Li Chang and Little Sister and curly beard departs to take over in the south-east. Li Chang becomes rich , and Curl Beard establishes his empire. This tale shows the foolishness of mounting a one man rebellion. Apparently. I thought Life of Pi would be a Picaresque; but in truth I think it was not. It was a strange book, a realistic myth, about a boy floating in the middle of the Pacific Ocean with a tiger. At first, for precisely the first hundred pages in fact, I was slightly bored. However, this turned out to be the necessary background to the story, the set-up, I suppose, which made the rest of the story seem quite true. 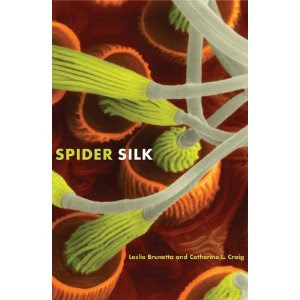 After that the story became absorbing and at the same time convincing, and I read quickly. I especially enjoyed the island sequence, and find it is this that lingers with me because it was so wonderfully weird. However, the part that really made the book for me was the ending. It took an already excellent book one stage further up the scale - to where it now occupies the 'outstandingly excellent' niche. It reminded me a little of Gulliver's Travels. However, it is not a picaresque, because a picaresque involves a lovable rogue visiting lots of different places, and Life of Pi did not contain either of these. 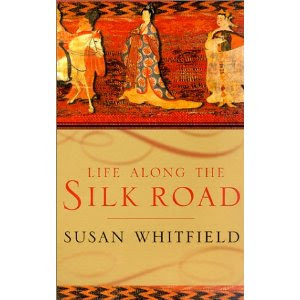 In contrast I read Life Along the Silk Road by Susan Whitworth. This, I thought, was fiction - but I was wrong again. The very interesting tales were based on historical events and artifacts found along the Silk Road, and it read very much like biographical non-fiction or history. 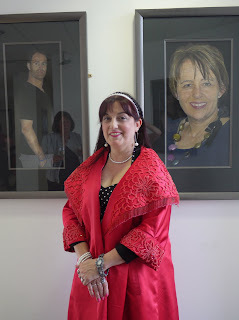 Although each tale is based on the information of various individuals and combined, Susan Whitworth brought it altogether skilfully, and I learnt a lot about the people that lived along the Silk Road; it was an appealing way to do so. 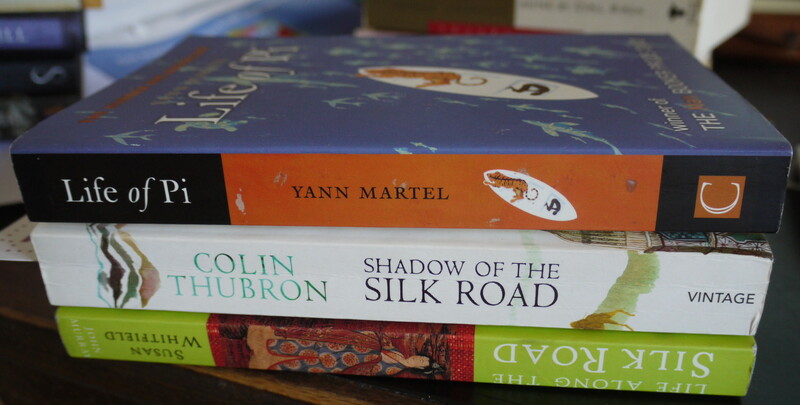 Finally, I read another travelogue: Shadow of the Silk Road by Colin Thubron. Colin Thubron's writing reminded me of W.G. Sebald's. It was personal, moving, imaginative, and above all lyrically beautiful. It took me a long time to read, because as I did so it set me thinking about my own experiences in China, and it also enticed me to the internet to find out more about places and subjects mentioned. As well as writing travelogues, Colin Thubron has written novels too, and I'd like to read them one day. 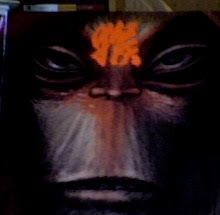 The only Silk Road book left on my pile now is Monkey by Wu Ch'êng-ên which I am intending to read just as soon as I have finished reading the T'ang section of poetry and prose in my Anthology of Chinese Literature which came this morning, and I have started already. 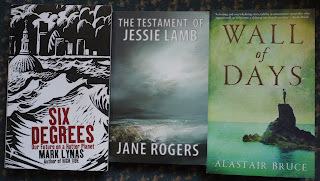 And then, after that, I intend to go on to a proper picaresque: Güneli Gün's On the Road to Baghdad as recommended by Anne S.
And then, waiting in the wings (or rather in another pile on my study floor), there are these...(by the end of the month I hope to have read at least some of them). An example of the famed whirling Uyghur dancing mentioned several times in my reading. It looks to be an exotic blend of Indian, central and western Asian styles. Slowly, very slowly, I am beginning to grasp the overwhelming complexity of the Silk Road. I've just finished my fifth book with Silk Road in the title, and just beginning to feel I know my way round a little. For instance, when I read today on the BBC news that two 'ethnic Uyghur men', Memtieli Tiliwaldi and Turson Hasan, have been executed by the Chinese, I know that the meaning of the term 'Uyghur' has changed over the last couple of thousand years. In 832 the Uyghurs lived in Mongolia and had only recently stopped being nomads. The Kaghan, their emperor, kept a yurt on the top of his palace, coated in gold, to remind him of his origins. Their capital, Karabaighasan, was a sumptuous and sophisticated place and, in one of the particularly interesting tales in Life on the Silk Road, The Princess's Tale, I learnt about the life of its last queen, Taihe. She was Chinese, and sent as a tribute-bride in an attempt to maintain peace between the two empires. She seemed to take to her new home because when various opportunities to leave arose she didn't take them. The Uyghur were of Mongolian stock, although the language they spoke was more like Iranian. The start of the end of the Uyghur empire came not from the Chinese but from the Kirghiz. These were tall, fair-headed people with green and blue eyes and came from the north-west i.e. the central Steppe lands of Russia to the south west of Lake Baikal. The Uyghurs, forced to flee from the Kirghiz in 840, set up camp at the border with China. The arrived en masse in an impressive city of yurts. This, understandably, caused consternation. At first, Princess Taihe was able to ensure (via her royal relatives) they were looked after, but within a couple of years her influence seems to have become disregarded because Uyghurs they were attacked by the Chinese. Those that escaped the massacre settled in the Tarim Basin. The princess herself sought, and was eventually given, sanctuary in Chang'an (the then captital of China near present-day Xi'an). The population of the Tarim Basin was already mixed. There were Sogdian merchants, Persians, Indians, Chinese Mongolians and Tibetans - to name just a few. But in the places where the Uyghurs settled (Kocho and Ganzhou) were mainly Indo-Europeans - descendents of the red-haired, pale-skinned Tochian mummies found buried there. They were Manicheans and Buddhists and, at that time, antagonistic to the Arabic city-states to the west. The Uyghurs intermarried, and the resulting genetic mix has recently been estimated to be 40% Indo-European and 60% Mongolian. It is an area that has been fought over for centuries. For many years the Arabs from the West, the Uyghurs form the north, the Chinese from the east and the Tibetans from the south. Later, the British (looking after their imperial interests in India) were involved too, and in the twentieth century the political struggle has been mainly between the Russians and Chinese. Kashgar is on the western end of the Xinjiang autonomous zone. The Chinese have made a determined effort to encourage Han Chinese to immigrate into this region so they have become the majority, and it is this which has caused the recent resentment. The Uyghurs are Muslim now, and so this has become a religious as well as ethnic struggle, but really this recent unrest in Xinjiang is just another battle in a war that has been going on for hundreds of years. 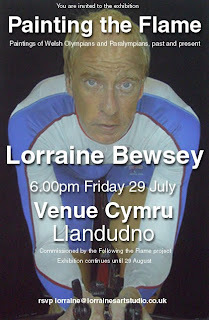 is an exhibition of Welsh Olympiad art by Lorraine Bewsey (here pictured with Roger Richardson of Venue Cymru). 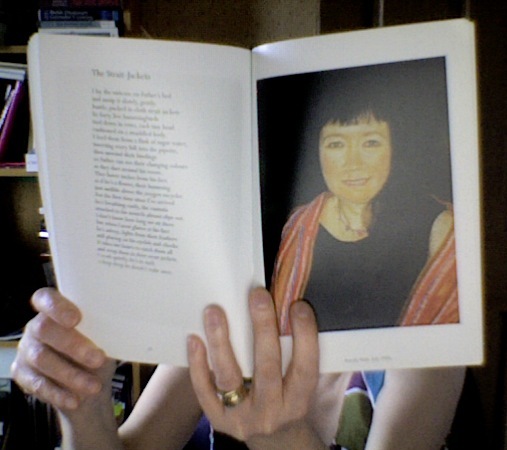 Alongside each picture is a poem, including one by the Man Booker longlisted Patrick McGuinness, and Pascale Pettit, whose poetry has been shortlisted for the T.S. Elliot award many times, and reading the one she donated here I can see why. It is an amazing thing featuring her bed-bound father being visited by the strait-jacketed hummingbirds she has brought with her in a case. 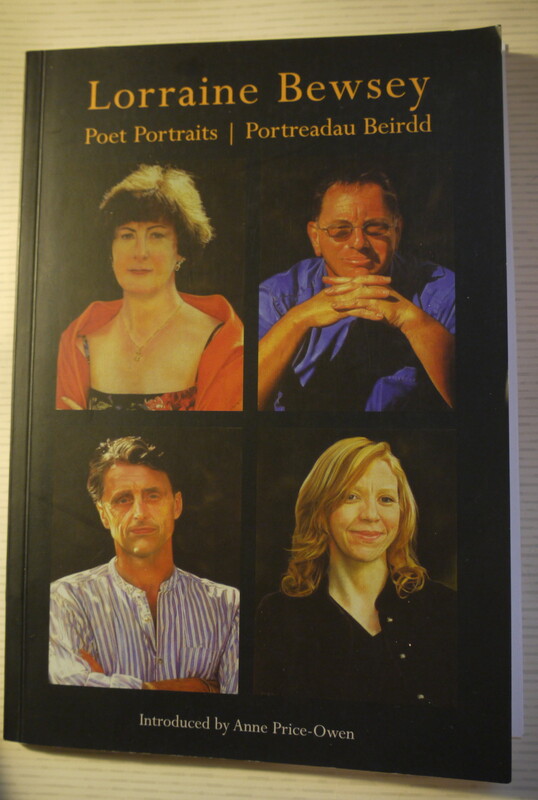 Pascale's portrait on the facing page is a particularly good one too. 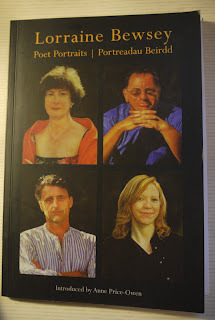 Although I very much like the poet's portraits, I think I prefer the portraits of the Olympiads and Paraolympiads. I think this is because what drives them is visible in the muscles and blood vessels of their bodies; whereas the poet's machinations are cerebral, and not so much of this necessarily shows in the face. They are well worth seeing on the wall, because only by inspecting them closely is it possible to see Lorraine's skill and attention to detail: each hair, each tiny freckle meticulously rendered.